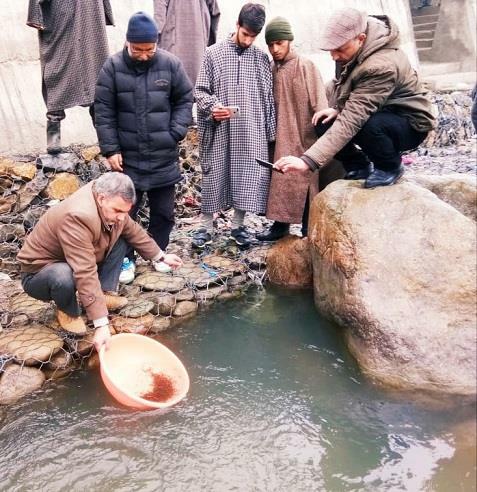 BANDIPORA, FEBRUARY 12: The Department of Fisheries Bandipora Tuesday stocked 60,000 brown trout seeds at various natural water bodies of the district including Madhumati, Arin and Bonar streams. Assistant Director Fisheries, Sajad Hussain, said the step was taken to compensate the losses due to poaching and floods and to increase the production in the trout streams. The seed was provided by Larebal Trout Hatchery. He said trout fish is a major attraction for tourist and locals alike and the Madhumati, Arin and Bonar streams are favourite natural habitats for the fish. He said the department stocks the seeds in these streams to increase the production, while steps are being taken to keep close check on poaching. He appealed the locals to cooperate with the department in this regard.